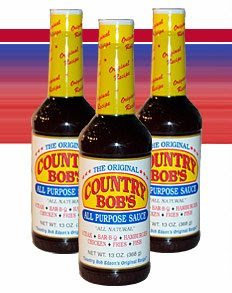 Have you ever used Country Bob’s All Purpose Sauce? If not, what are you waiting for? Seriously! I love wings. You wanna know where the best wings are and in what town….I know! 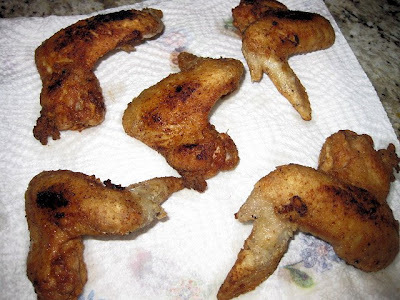 I love chicken wings…and they MUST have the bones in because I don’t want no chicken finger in plain sauce. I want a good wing with some great sauce that has just the right amount of zing. I don’t even care about eating them in public. I have found the way to dig in and still make sure you don’t become the entertainment of the night. 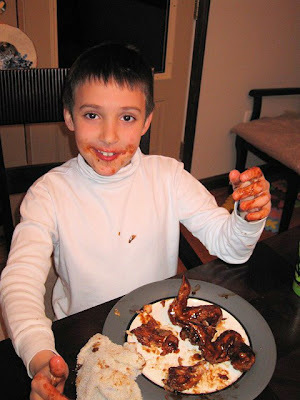 As we know there really isn’t any “neat” way to eat a chicken wing LOL! So, I’ll be honest when I first received the 2 bottles of Country Bob’s All Purpose Sauce I almost went with a different recipe, since I wasn’t sure if it could live up to my standards LOL. They sent me a pamphlet with some really great recipes on it (can find even more on their site). I knew if the wings were stand out I’d be disappointed. Well, Let me tell you….No disappointment here. NONE. This sauce has such a great zing to it while not burning off your mouth as some tend to focus on the burn and not the zing. Now don’t confuse me this is more of a BBQ flavor not a hot/mild type sauce. Wanna try the great recipe I made? 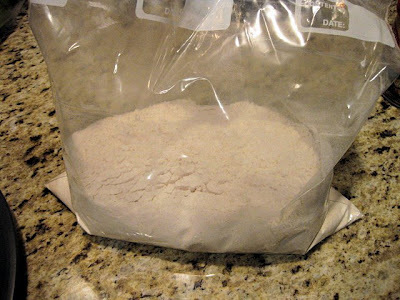 Combine the dry ingredients into a plastic bag. I used a freezer sized one. I didn’t have any granulated garlic so I used garlic powder….if you plan on substituting its half the amount. 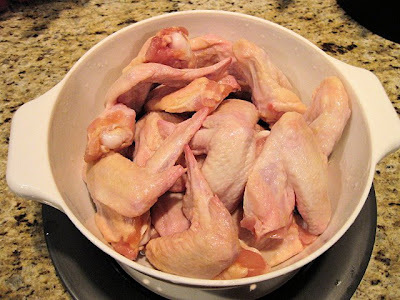 Take a few chicken wings and shake them well inside. I did about 5-6 at a time. 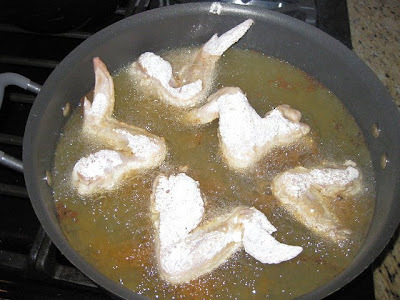 Once the oil is smoking- place your wings in the oil. Be careful it’s going to splatter and if it gets you- it hurts! I strongly advise any small children NOT be present. 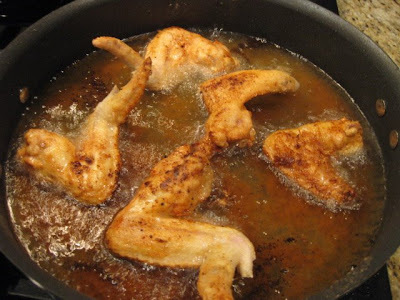 Cook until golden brown….about 6-10 minutes. Remove and place on a few paper towel to remove any excess grease. 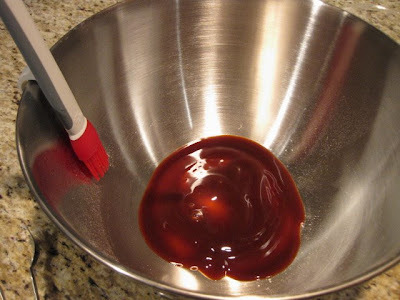 In a separate bowl; pour some of the Country Bob’s All Purpose Sauce. Place chicken wings in and stir. I used a brush too to make sure I got every nook & cranny! They look good, huh? I know you’re drooling! There’s a reason this sauce has been around for over 30 years! Oh, and what did the 8 year old chicken hating I’m too picky to eat anything boy say? Country Bob’s is giving away a bottle each to 2 of my readers. Yes 2 of my readers! 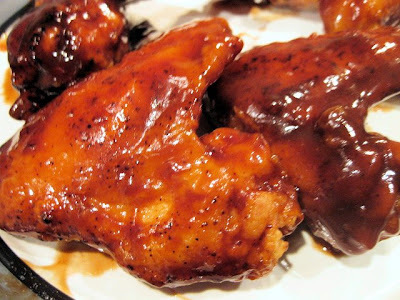 So now you can make these finger lickin’ good wings of your own! ______________________________________________If you would like to be considered for an upcoming feature/review please contact me by email which you can find in my profile. PR Friendly. Thanks! i can’t wait to try this recipe! i’m not entering to win…i already won a bottle on another giveaway, so i want someone else to have a chance, but i can’t wait to try those wings! thanks for sharing! It’s look so easy and so delicious. Okay, I LOVE baked beans and I always offer to bring them to our family get togethers…I would love to try Country Bob's Baked Bean Recipe and blow my family away:) I am already a follower! I have completed #1 & #2, but I am not sure how to do #3 … forgive me, I'm still new at blogging:) Thanks! MMM they look so so so good! I would try the BBQ lamb kabobs I love lamb!! The Country Bob’s Baked Beans sound great!!!!!!!! The sauce sounds so so yummy, it’s making me hungry already. I would love to try the sauce with the BBQ Spareribs recipe.